In this scene, Francis takes off his clothes and hands them back to his father. In the lower church at Assisi, the images are matched with stories of the Christ on the opposite wall. (This is true too of the upper church, though the parallels there are more subtle.) The matching lower church scene is the stripping of Christ at the Crucifixion, an important match when considering Francis as the New Christ. In both images, Francis's father, Pietro di Bernadone, looks menacingly at his son, and is held back by others. Francis does not look at him; his gaze is upward, regarding the Heavenly Father rather than his own. The hand of God blesses him from above in the Assisi image. The bishop covers Francis's nakedness. 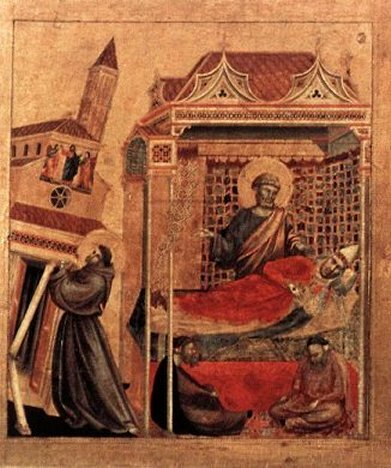 In a number of ways, the Bardi Chapel image is more sophisticated that the Assisi one. The buildings in the Assisi image are rather clumsy, and do not have a story to tell. The Bardi building uses perspective very powerfully. On the side with Francis's father, the building is open, suggesting the courtyard of a wealthy house. On the side of Francis and the bishop, the building is contained, ecclesiastical looking. A fascinating detail concerns the two children shown in both images. In the Assisi fresco, they are simply observers of the scene. In the Bardi chapel version, they get involved, preparing to throw stones at Francis, though their mothers are doing their best to stop them. It is suggested that this is intended to echo this mistreatment of Christ during the events of the Passion. 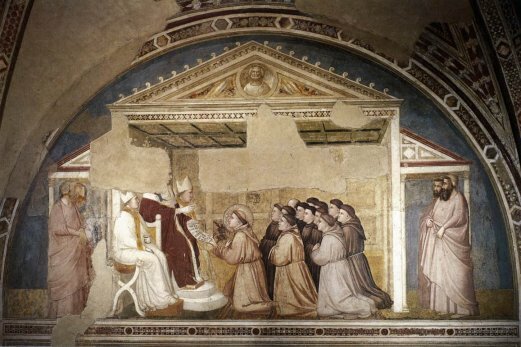 The Franciscan movement required the approval of the Pope, and this was proving difficult. It seems that Innocent III approved, but the cardinals were not convinced. In 1209, Innocent claimed to have had a vision of the Lateran basilica in a state of collapse. In the words of Bonaventure, he saw a poor little man, of mean stature and humble aspect, propping it up with his own back, and saving it from falling'. 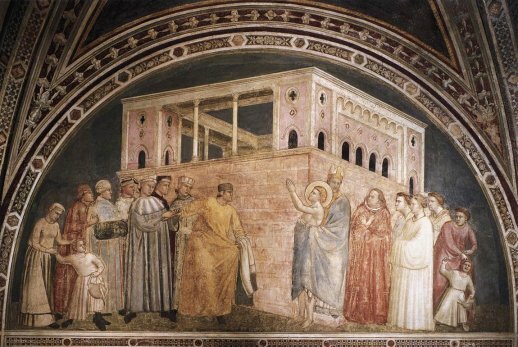 The humble man was clearly Francis, and the Lateran, established by the gift of Constantine, represented the church as a whole, to be saved and renewed by Francis. 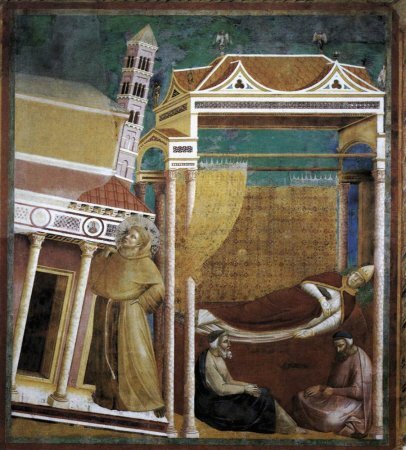 The Giotto version, from the Louvre panel, is clearly influenced by the Assisi fresco: Pope Innocent's roof is an obvious example, as is the two figures at the pope's bedside. Once again, this image works rather better than the one in Assisi. In that image, the rather relaxed Francis seems to show that no effort is required to support the church. In the Louvre panel, a pillar has collapsed and Francis requires both hands to prevent the collapse. Apparently, the depiction of the church is more accurate; Giotto includes the fresco originally on the front of the church. (It's not there now; sadly the present rather bombastic facade dates from 1735.) The addition of St Peter, behind the bed, adds authority to the story; he was the first pope. The extra authority provided by Peter in the Louvre painting is a reflection of the image's function. This is an altarpiece, a public artwork. 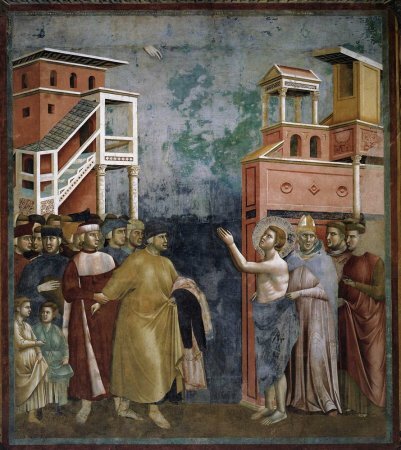 At the time of Giotto, Franciscanism was in turmoil, split between the Conventuals, who accepted the need for the order to own property along the lines of other orders, and the Observants, who followed Francis's strict rules on poverty. The image of Francis holding up the church stresses the importance of the order to the church as a whole to a secular audience. It can be regarded as a political as well as a religious statement. This is perhaps the key image that concerns Franciscanism rather than the story of Francis himself. 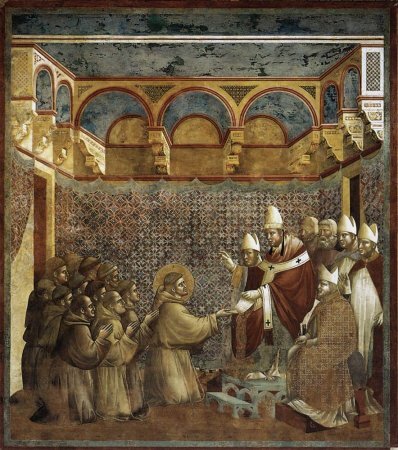 Here, Innocent III blesses the Franciscans and confirms the order's legitimacy. In actual fact, these images rather overstate the case. 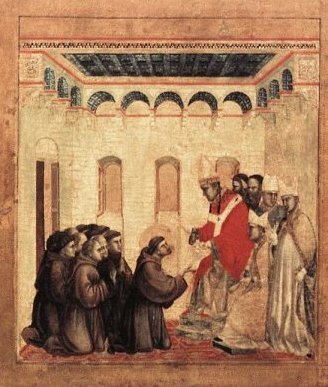 There was still opposition from a number of cardinals to validating the Franciscan order (they were probably not very keen on the idea of poverty) and no document such as the one in the image was produced. As mentioned, the frescoes in Assisi are more concerned with theology than promoting Franciscanism to a wider audience, and the images are linked to others showing Old and New Testament themes. The Old Testament image immediately above the Confirmation of the rule seems appropriate, as it also shows a blessing, but is it? We see Isaac being tricked into blessing Jacob - he got the wrong one! For a lay audience who were familiar with the story, this wouldn't work. Clearly for those in-the-know Franciscans this led to deep discussion: Isaac got it wrong, but Innocent got it right! I have discussed this further on my commentary on the Assisi frescoes here. For the Louvre panel, underlining the legitimacy of the order to a lay congregation was the object of the exercise. Architecturally, the Bardi Chapel image is the most sophisticated, with its classical pediment. Behind Francis twelve brothers are kneeling, a reference to the twelve apostles. The Assisi image has eleven; perhaps here the pope represents Peter. The Louvre panel follows the Assisi fresco quite closely.